The terraces are both equipped with tables and chairs for outdoor dining, there is a barbecue and a sun terrace with sun loungers. We are located in the heart of Lipari, close to the main square of Marina Corta, a stone's throw from the main street and just a few minutes from the Aeolian Archaeological Museum and the Castle. Our holiday home is ideal for exploring the wonderful Aeolian islands, which offer outstanding opportunities for snorkelling and diving, as well as a host of watersports. You could potter around the island on a scooter, or take the ferry over to the tiny island of Vulcano, and bathe in sulphur mud baths. In the evenings, take a cruise out to Stromboli and watch the volcano spew lava into the night. What can be better than tasting a typical dish from the Eolie Islands while sitting on a terrace with breathtaking view! Idealic simple getaway in great location. What a delightful apartment, situated in the Marina Corta. There are two terraces overlooking the harbour and sea, with daily visits from wonderful sailing ships. The facilities are good and excellent restaurants close by. We were collected and returned to the main harbour by Antonella and Giuseppe. We had a great stay. 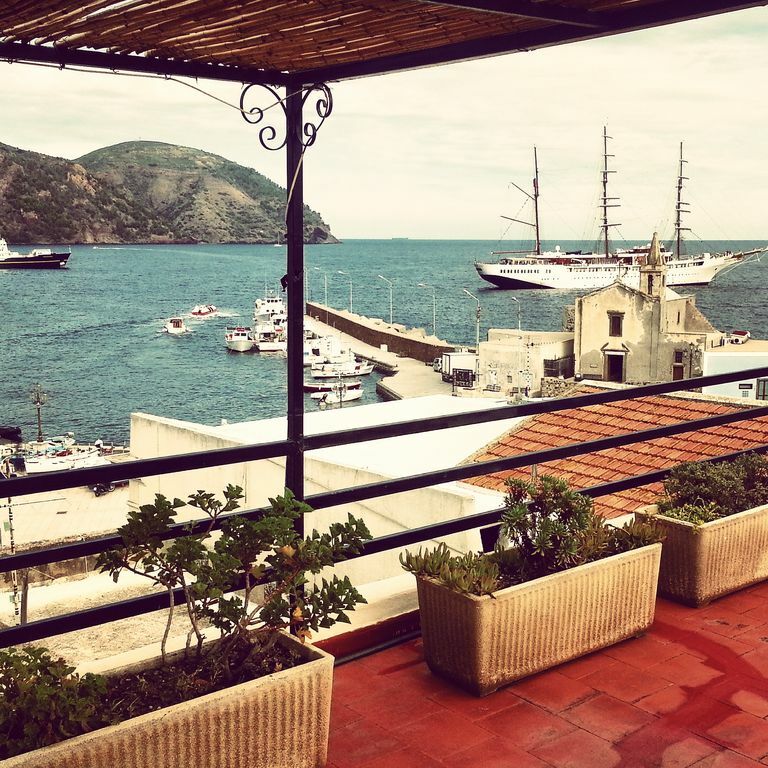 "This accomodation is located on the best spot in Lipari: a few steps away from the Little Harbour. Either by spending your leasure hours there, [erhaps on one of the terraces, or on one of the 2 roof top terraces part of the accomodation: it is great! A couple of s to come steep steps to get to your place doesnot make it a suitable place for elderly people or ones with heavy Luggage ;-). Lovely family that rents out this place, and they try their best to let you enjoy your stay in their appartment. Kitchen is very/very basic, but then again, life is outside in Italy, and Lipari is not much differenT. Also a nice town for some shopping." "This was a perfect apartment for the two of us. The terraces are great.Beautiful views. We were made very welcome by being picked up at the ferry and also a week later on leaving in the morning we were brought back to the ferry. Clean and quiet and closeby everything.Many thanks!" "Delightfull compact house on second floor. Charmingly positioned in an alley near an pasticceria, from where the heavenly smell of the cannoli sometimes reaches until the roof terrace. Tasting this cannoli is almost reason enough to visit Lipari. Interior in authentic local style. In the evening you can see and hear the italian life around you coming alive from terraces, alleys and restaurants. Very friendly owners. There is no better place thinkable to visit lipari and the other islands. Afterwards you can relax on the beautifull roof terrace. A place to feel happy!" "We loved our stay at this apartment which was right in the heart of the historial centre of old Lipari Town and close to the Port and shops. The owner greeted us at the Port on our arrival and drove us with our luggage to the apartment. She waS extremly helpful and friendly and was prepared to drive us back to the Port for an early morning boat back to Messina. The two roof top terraces with outdoor dining were wonderful, as was the cake shop right at our door step. The access to the apartment was via steep stairs and would not suit anyone with mobility issues. The neighbourhood was peaceful with only church bells to break the silence. This stay was very special and we hope to return some day." "Really lovely little flat with a fantastic roof terrace. Location is just off the harbour so near to restaurants and small beach. There could be some noise. Owners really kind and helpful, flat was clean and furniture not new but comfy . Be careful with very young children it's quite a drop and the window in the bedroom has no lock. All in all we loved it."